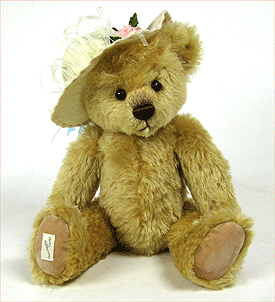 Marie Teddy Bear by Deans. A beautiful limited edition item, hand made in beige mohair. This very special piece, is a Limited edition of only 299 pieces worldwide. The origins of the Dean's Rag Book Co Ltd.date back to London in 1903, Dean's have always been at the fore front of toy design and manufacture and were the first British company to produce teddy bears as early as 1915 and probably even earlier from 1906. Dean's made many types of toys from rag books, for which they were initially famous, to beautifully crafted dolls, teddy bears and even Mickey Mouse and other characters.